We’ve heard this song before. Let’s make a few predictions based on past instances of this particular strain of hobby cancer, shall we? Wargames are a hobby for everyone, and they need to be made more inclusive, and that means we’re going to need to make a few changes around here. Fundamental changes. You know. Because we love the hobby so much we really need to turn it into something completely different. Like we did for sf/f literature, tabletop RPGs, vidya games, and comic books. We need to strip away all of the things that make wargaming so wargamey, and make it a lot friendlier to people who don’t actually like wargames, and then it will be popular. Why, it might become so popular that it can support a community of people who don’t actually play games, but only watch wargame themed reality shows on YouTube. And then we can write rules for wargames to appeal to the people who don’t buy wargames, just wargame themed shirts and jewelry and stuffed animals. That’s how you fix everything that’s wrong with this hobby that we all loved so much for what it is that we couldn’t wait to make it something that it isn’t. Mark my words, that tweet is cancer. 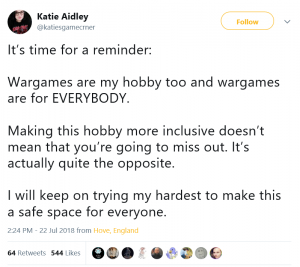 It’s the initial, benign tumor settling into the hobby until it has enough support from thirsty men more desperate for approval from hobby-celebs than they are desperate for some hot counter on hex action. Once it has that core of vocal support, it’ll explode into full malignancy, and then it’ll all be over but the Old School Revival by badwrongfans seeking to preserve the core of the hobby. I give it two years, tops. You might want to horde your classics and start thinking of an alternative name for wargaming right now. We’re all going to need it.